These are extremely high purity, solid Cadmium metal rods. They weigh approximately 9 ounces (255 grams) each. 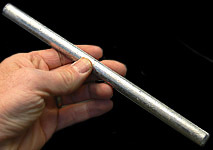 The rods measure 10-3/4" long x 1/2" in diameter. Cadmium is a chemical element, atomic number 48. Perfect for element collectors or those who need high purity Cadmium metal for experimentation/manufacture. These high purity Cadmium metal rods are ideal for all research and laboratory/alloy uses. Cadmium metal is used to make a wide variety of low melting temperature alloys; it is used in electroplating, in the manufacture of LCDs, and as a lasing medium in Helium-Cadmium lasers. For those of you constructing small nuclear reactors, a few of these could come in real handy for control rods (you know what a drag a meltdown can be). Fine Cadmium metal dust can be toxic so normal laboratory safety precautions should be used if grinding or cutting the rods.